The Buffalo Bills, under Head Coach Marv Levy, had won four straight AFC titles from 1990 through ’93 but after getting off to a 5-3 start in 1994 had lost two straight contests and were just 5-5 as they hosted the Green Bay Packers on November 20. 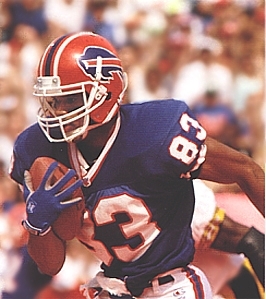 Age and the resulting wear-and-tear were beginning to catch up to 34-year-old QB Jim Kelly and seventh-year RB Thurman Thomas, although the other vital cog in the offense, WR Andre Reed (pictured above), was coming back successfully from an off-year in 1993. The defense, although it still contained outstanding performers in DE Bruce Smith, LB Cornelius Bennett, and FS Henry Jones, was no longer as formidable as it had once been – and Smith was out for the game with the Packers due to a shoulder injury. Green Bay, with Mike Holmgren at the helm for the third year, was a team moving in the opposite direction. Coming off their first postseason appearance in eleven years, the Packers had an up-and-coming quarterback in Brett Favre, an excellent wide receiver in Sterling Sharpe, and a defensive line anchored by the All-Pro DE Reggie White. Moreover, the Packers were on a roll, having won their previous three games, and came into the contest at Buffalo with a 6-4 record. There was a crowd of 79,029 at Rich Stadium. The Bills had first possession and drove 78 yards in nine plays, the big one a 26-yard Kelly completion to WR Billy Brooks to the Green Bay 12 yard line and capped by a five-yard scoring carry by Thurman Thomas. Following a punt by the Packers, Buffalo put together another long 15-play drive that covered 80 yards. Kelly completed eight passes along the way, including the final one to Andre Reed for 15 yards and another TD. The Bills were up by 14-0 after a quarter of play. The Packers still couldn’t get into Buffalo territory on offense and had to punt. Once more the Bills had a long series of 14 plays for 66 yards, helped along by a defensive pass interference penalty that nullified an incompletion in a third-and-six situation. The methodical drive reached the Green Bay five, but this time the Bills were unable to penetrate the end zone as Kelly was sacked by DE Sean Jones for a 14-yard loss. They settled for a 38-yard field goal by Steve Christie to extend the lead to 17-0. The teams traded punts as the Packers finally held the Buffalo offense to a three-and-out series, but a pass by Brett Favre was intercepted by CB Mickey Washington who returned it 36 yards to the Green Bay 13. Two plays later Kelly passed to Reed for a 10-yard touchdown and the Bills were seemingly in complete command at 24-0. With time running out in the second quarter, the Packers responded with a scoring drive of 60 yards in five plays. All were pass completions by Favre, including a 29-yard TD throw to Sterling Sharpe. However, Chris Jacke’s extra point attempt was blocked and the score remained 24-6. It wasn’t the end of the first half scoring as the Bills, taking over with 58 seconds on the clock, went 42 yards in five plays, the most notable a Kelly completion to WR Russell Copeland for 35 yards. Christie kicked a 51-yard field goal on the last play of the half and it was 27-6 at the intermission. The Packers narrowed the margin with their first series in the third quarter. Favre completed eight passes as Green Bay went 70 yards in 11 plays, the last one for a five-yard touchdown to RB Edgar Bennett. This time the extra point attempt was successful and the tally now stood at 27-13. The Bills made it to midfield on their ensuing possession and punted. Helped by Favre passes and an 18-yard run by Bennett, the Packers went 77 yards in eight plays and once again it was Favre passing to Sharpe, this time for a 26-yard TD. With the extra point it was 27-20 and the visitors were back in the game entering the fourth quarter. It seemed as though the momentum was surely in Green Bay’s favor when a Kelly pass was intercepted by CB Terrell Buckley, who returned it 26 yards to give the Packers good starting field position at the Buffalo 49. However, they were unable to advance as Favre threw three straight incomplete passes and they were forced to punt. The Bills responded with another long, methodical drive. Kelly converted two third downs with passes to Reed and, while Thomas was unable to gain anything on the ground, Buffalo reached the Green Bay seven. But Christie’s 25-yard field goal try hit the right upright and was no good, keeping the Packers just seven points behind with over six minutes still on the clock. Once again Buffalo’s defense held and the Packers punted from their 30. Trying to run the clock out, the Bills converted a third-and-nine play on their next series on another Kelly throw to Reed that covered 15 yards. After reaching the 50, Buffalo finally punted and pinned the Packers down at their 10 yard line with 2:25 remaining thanks to an outstanding play by special teams star Steve Tasker to drop WR Robert Brooks in his tracks before he could make any sort of return. There was no stunning comeback for Green Bay on this day. With the crowd roaring, Favre tossed an incompletion, was sacked for a nine-yard loss back to the one and, fading back on a third-and-19 play, a holding penalty not only nullified a great catch by WR Anthony Morgan for an apparent 27-yard gain but, because it occurred in the end zone, gave Buffalo two points and forced the Packers to have to kick the ball away. That was all the Bills needed as they ran out the clock for a 29-20 win. The Bills dominated in total yards (455 to 266), first downs (27 to 18), and time of possession (38:23 to 21:37). Each team turned the ball over once. Andre Reed set a club record with 15 catches for 191 yards that included two touchdowns. Jim Kelly (pictured at right) completed 32 of 44 passes for 365 yards with two TDs and an interception. Thurman Thomas had a rough outing, gaining 80 yards on 31 carries (2.6 avg.) while scoring once – he also added 25 yards on four pass receptions. For Green Bay, Brett Favre was successful on 22 of 40 throws for 214 yards with three touchdowns and an interception. Sterling Sharpe had 5 catches for 86 yards that included two TDs. Robert Brooks gained 40 yards on his 5 pass receptions and Edgar Bennett also caught 5 passes, for 22 yards and a TD, while leading the club in rushing with 45 yards on 8 carries. The victory over the Packers did not signal resurgence by the Bills – they won only one more game and finished a disappointing fourth in the AFC East at 7-9, which was the club’s first losing record since 1987. Green Bay lost its next two contests but recovered to end up at 9-7 for the third straight year, good enough for second place in the NFC Central and a Wild Card berth in the playoffs. The Packers edged Detroit in the first round before losing to Dallas at the Divisional level. Andre Reed caught a career-high 90 passes for 1303 yards (14.5 avg.) and eight touchdowns. He was selected to the Pro Bowl for the seventh consecutive year. 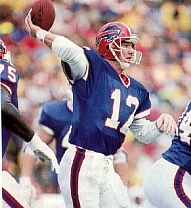 Jim Kelly, who missed two games, completed a NFL career-high 63.6 percent of his passes for 3114 yards with 22 touchdowns and 17 interceptions. Brett Favre ranked second in the league in passing (90.7 rating) while achieving new highs for yards (3882) and TD passes (33) – numbers that would quickly be surpassed in the MVP seasons that followed.